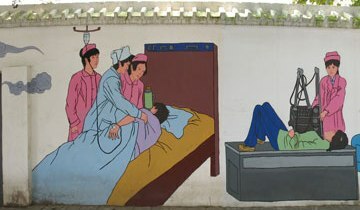 Dozens of medical images have been painted on the wall outside Kunming’s biggest hospital, illustrating how both Chinese and western medicine have played important roles in disease prevention and health promotion in China. 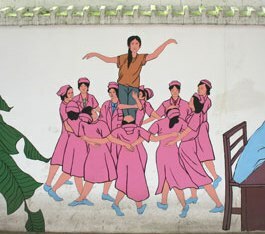 In order to welcome the national Special Olympics for disabled athletes (May 2007), Wang Feng created the mural with ideas from his imagination and suggestions from the First Affiliated Hospital of Kunming Medical University. He drew the mural by hand. 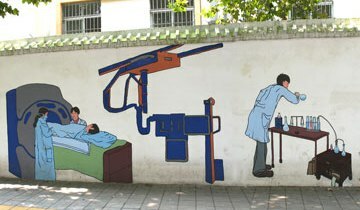 The first part of the mural is about the past, when Chinese medical science was the only way to prevent disease and improve people’s health. It features several famous doctors, such as Hua Tuo and Li Shizhen.  The second part shows how modern medical practices are used in China today to help Chinese doctors diagnose and treat disease. 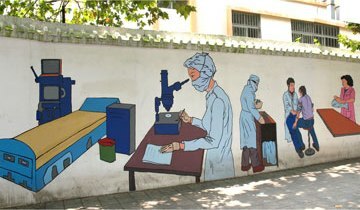 The wall even shows how foreign doctors have come and helped China develop advanced medical techniques. 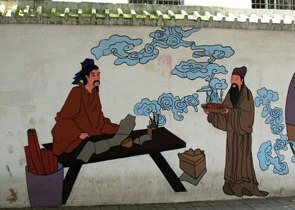 Wang Feng’s mural outside Kunming’s First Affiliated Hospital is a graphic illustration of the cooperation between traditional Chinese medical science and modern western medicine that have brought a better quality of life and longer life expectancy to Chinese people. 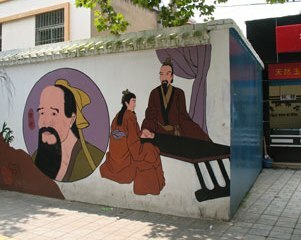 When you go by the first affiliated hospital of Kunming Medical University, you may be attracted by the beautiful mural on the wall. 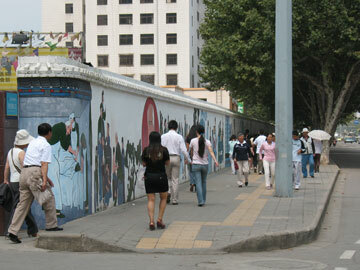 The mural was created to welcome the national Special Olympics for disabled athletes, which was held in May, 2007. The artist, Wang Feng, is a student at Yunnan Art College. 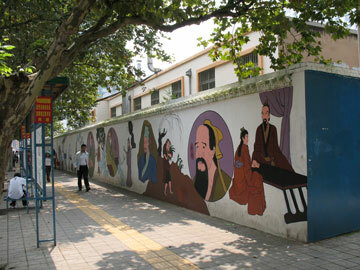 The mural originated from suggestions from the hospital and also from the artist's imagination. He drew the mural in three parts. Firstly, it depicts the development of medicine from ancient to modern times. Secondly, it shows the great effect foreign western medicine has had on our country's medical science. For example, a famous foreign surgeon, Dr. Bethune, made a great contribution to our country's people and medicine. Thirdly, it shows aspects of the first affiliated hospital of Kunming Medical University, especially in respect to changes in equipment and service attitudes in recent years. 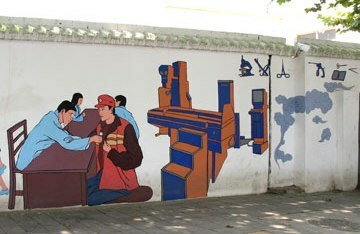 Wang Feng said he drew the mural by hand with the help of computer. As a way to welcome disabled athletes to Kunming, and to teach pedestrians about the history and development of medical science, this beautiful mural is a great addition to our community. Huatuo was a famous ancient Chinese medical scientist, best remembered for his creative discoverys and high sense of morality. During the late Han dynasty (202 B.C.~A.D. 220), Huatuo created Ma-fei-san (麻沸散), which was the ancestor of modern anesthesia. He is also considered to be the first surgeon in China, because he was the first doctor who cut people open to save lives. Furthermore, Huatuo was also known for inventing Wu-qin-xi (五禽戏), in which one imitates the actions of tigers, deer, bears, apes and birds. Doing this improves people’s immune systems, which in turn helps to prevent illness. In addition to his innovative medical skills, Huatuo’s medical morality has been respected for generations. He always treated poor people without receiving a single coin and he also was a person who indulged himself into medical scientific study with no expectation for fame. China’s ancient physician Huatuo possessed the spirit of morality and creativity, and through new practices like anesthesia and surgery he saved many lives and set an example for doctors throughout the ages. Hua Tuo (AD 110-207) was a famous physician in Ancient China, sometimes called the “divine physician”. As the first famous Chinese surgeon, he developed the use of anesthesia, and furthered the limited Chinese knowledge of anatomy. Hua Tuo, a master in internal medicine, surgery and acupuncture, succeeded in saving the lives of numerous patients. He was an extremely honorable person, remembered for his contribution to the later advancement of Traditional Chinese Medicine. 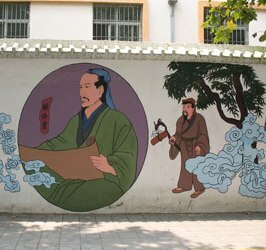 Although Hua Tuo passed away thousands of years ago, his admirable medical skills and his humanitarian spirit will be remembered forever; that is why his image is a fitting way to begin this mural. Li Shizhen (1518-1593) was a famous medical author and pharmacologist in ancient China, and he remains a role model for medical students today. He was born in an old and well-known medical family in the Ming dynasty. For 10 years, he read widely and practiced diligently. Through hard work, he became a famous doctor. Meanwhile, he noticed many mistakes in previous medical books, so he made up his mind to correct those false theories. During 27 years, by practicing medicine in many mountain villages and trying various experiments, he made innumerable observations and collected a large number of different plants, minerals and animals, and finally finished his pharmacology masterpiece 《本草纲目》(Ben Cao Gang Mu). Later on, it was his critical thinking skills, creativity and strong will power that encouraged doctors to dedicate themselves to medical science. Li Shizhen is regarded as the most influential pharmacologist in ancient China; his book《本草纲目》(Ben Cao Gang Mu) and his arduous experiences have inspired doctors to be objective and analytical, and are great treasures in the field of medicine. Li Shizhen, one of the greatest scientists in China's history, was considered a medical saint. Long ago, some people said they had magical power to treat patients. These wizards and witch-doctors used some odd ways to treat the sick. With the development of society, people began to find ways to protect themselves. Li Shizhen (1518-1593) was born in the Ming Dynasty. He traveled over numerous mountains and rivers to collect a large number of folk prescriptions. It took him 27 years to finish his great work, the Compendium of Material Medica (本草纲目), which was monumental in China's pharmaceutical history. Li Shizhen, a pioneer in Chinese medicine, gathered medicinal herbs and treated ill people, them people began to know what caused illnesses and how to treat them. Sun Simiao (541 A.D.-682 A.D.) was a famous traditional Chinese medicine doctor who is known as the father of prescription science because he wrote 《千金方》(Qian Jin Fang) after studying the basic components of medicine. Sun is also called “Yao Wang” (the king of medicine) in China. His biggest contribution was to develop the method of using medicine. His research is reported in many books (he wrote almost 80 books), but 《千金方》(Qian Jin Fang) is his most remarkable work. The work contains about 8000 prescriptions to tell other physicians how to use herbs for medicinal purposes. It also teaches about how to have a healthy life style, because bad behaviour can not only lead to illness, but is also a main reason for recurrence (复发). Sun worked to develop medicine from the parts of plants and animals. From gathering herbs to curing people, Sun did everything on his own. Full of ethical compassion, Sun believed that people’s lives are more important than gold. Sun Simiao was a great Chinese medicine doctor whose herb research and influential book 《千金方》(Qian Jin Fang) helped prescription science become more professional and systematic. Sun Simiao, who lived in the Tang dynasty (581-682 AD), was the "'King of Chinese Medicine". He was a pharmacist, nutritionist, medicine specialist and acupuncture specialist. When he was a child, he saw that the poor around him didn't have money to see a doctor, and most of them died without treatment. Because of this, he decided to study medicine when he was 18. During his 102-year life, Sun Simiao devoted himself to his remarkable medical practice and wrote a 30-volume encyclopedia (Qian Jin Yao Fang) on Chinese medicine that still exerts influence today. In addition, Sun Simiao was the first person in the world to initiate catheterization, and was the first one who cured beriberi, 1000 years earlier than in Europe. Doctor Sun Simiao will long be remembered for his pioneering medical work, kind heart for the people, and the important medical books he left to guide future generations. As a great herbal doctor in ancient China, Zhang Zhongjing not only created new prescriptions to cure and save people, but also wrote medical books and invented useful techniques to enhance medical development. To help the poor people fight the common cold, Zhang created a prescription (actually a kind of dumplings) that is made of cotton, pepper and herbal medication. In order to honor Zhang and his contribution to prescription science, people still eat dumplings on Winter Solstice Day (冬至). Zhang also wrote the book 《伤寒杂病论》 (Shang Han Za Bing Lun; Typhoid Fever and Miscellaneous Diseases), which was quite influential to medical development. The medical knowledge in his book was the most advanced at that time. In addition, Zhang is the founder of artificial respiration. He used this technique to save many lives, and it is still being used today. People, especially young doctors, should learn from Zhang, because his prescriptions rescued patients from diseases, his writings deeply influenced medicine, and his discoveries have saved many lives. 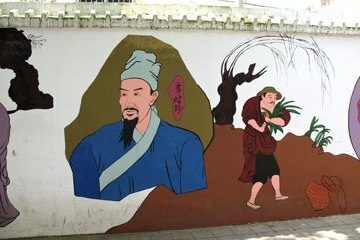 Zhang Zhongjing (AD 150-219) is one of the most renowned ancient herbal doctors in China's medical history. In his lifetime, there were lots of wars in China and he saw many normal people die with diseases, so he decided to be a good doctor for them. He went to study Chinese medicine from his relative, the famous doctor Zhang Bozu. Zhang Bozu thought his student was very hard-working, therefore he taught him all the knowledge he knew. When Zhang Zhongjing was 50 years old, there was a grave plague in China; two thirds of the population were infected. Zhongjing worked whole heartedly to do research and find solutions to the problem. After several decades, he finished the book "Shang Han Za Bing Lun". The work contains over 1 00 effective formulas, many of which are still used today. The text presented some basic theories of Chinese medicine and implied a theoretical framework that lead to hundreds of books analyzing, explaining and reforming it. Zhang Zhongjing is remembered as a model medical student, and his book presenting both medical formulas and theories is indeed a cornerstone in Chinese medical history. Although Traditional Chinese Medicine (TCM) has long been accepted as scientific in China, in America TCM has struggled for its legal status for ages. In the middle of the 1800s, Chinese herbs first emerged in America, brought by Chinese laborers. When TCM first appeared in America, Americans regarded Chinese acupuncture needles and herb teas as an equivalent to necromancy (巫术). With increased use, more and more Americans came to accept this “magic medicine”, even though the medical community, government, and mainstream culture were slow to acknowledge it as medical science. Not until 1994 did the American Congress authorize the use of Chinese herbs as health products. In 1997 acupuncture was officially acknowledged as an “efficient and standard treatment”, and in 2000 TCM was listed as one of the complementary forms of medicine in the American medicine system. Although Traditional Chinese Medicine was originally misunderstood and rejected in America, it has gradually gained acceptance and respect at official levels, and today it is often considered as an alternative choice when Americans get sick. Zhang Zhongjing, (AD 150-219) was a famous medical scientist in Nanyang during the Eastern Han Dynasty. He enjoys a high reputation at home and abroad in the medical profession. 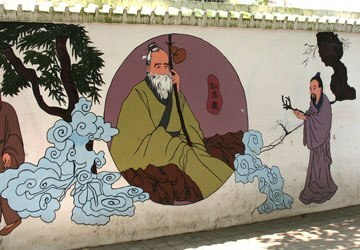 He has been called "Medical Sage" by the Chinese people. Zhang Zhongjing read a lot of books about traditional Chinese medicine, which systematically summed up the essence of medicine before the Han dynasty. According to his own rich experience in medical practice, he wrote the book "Shang Han Za Bing Lun" (伤寒杂病论: The Treatments for Typhoid and other Complicated Diseases), which has 16 volumes in total. The book "Pills of Six Drugs including Rehmannia" is modified from "Jin Kui Shen Qi Wan," which was also written by Zhang Zhongjing. It includes the formulas for six drugs and has become a classical treatment for kidney problems. Zhang Zhongjing was really a great, kind-hearted doctor; his work is very important to Chinese medicine, and it is still helping many patients. Advanced auxiliary examinations are widely used in hospitals to effectively help doctors and patients, but a reliance on technology also has disadvantages. With the help of equipment, doctors can diagnose patients with improved accuracy and cure patients more efficiently. For instance, capsule endoscopy can find a minimal lesion that can’t even be found during an operation. Moreover, definite results of advanced tests help verify doctors' diagnoses and help reduce disputes about medical treatment. However, many people complain about high medical costs because some doctors ask them to undergo unnecessary tests in order to improve the utilization of medical equipment. In addition, false positives are inevitable, which may mislead diagnosis. Furthermore, medical conditions in China suffer from a serious imbalance between different regions, as well as between large and small medical facilities. Doctors in general hospitals find it hard to decrease reliance on technology, while physicians in small clinics must adapt to work with less advanced machines. The use of advanced auxiliary examinations helps improve diagosis and reduce doctor-patient conflicts, but disadvantages like higher medical costs, misleading results, and serious "technology" imbalances between China's big and small medical facilities need to be overcome in order to utilize auxiliary testing equipment effectively. In the past, doctors used to diagnose according to their clinical experience; there were many subjective factors and limitations, so the rate of making diagnostic mistakes was very high. But with the development of science and technology, various auxiliary diagnostic methods are now available. On the right of the picture, a technician is doing experiments with a patient's body fluid, such as a routine blood or urine test. An X-ray machine (shown in the middle) can be used to do fluoroscopy or radiography of a patient's chest, head, vertebral column, pelvis and so on. On the left, the patient is lying on a bedlike machine called a CT (X-ray computed tomography), used to get sectional pictures inside the patient's body. With modern tools like these, doctors can get much more objective and correct information about patients so that they can make an accurate diagnosis. In the past three decades, Chinese diagnostic technology in health care has been improved with the development of science and technology. Before the past three decades, diagnosis of diseases mainly relied on experience and physical examination, for few instruments were utilized to examine the internal structure of the human body and check for pathology (病理学). However, the increasing medical use of microscopes helped doctors study the microstructure of cells, bacteria and viruses. Since the appearance of microscopes, fewer people have died from infections. Furthermore, doctors can now use advanced assistant examination equipment, including X-Ray, CT, and MRI machines, to observe the internal organs and skeleton systems. The CT/MRI machine has become one of the symbols of a modern hospital, by means of which doctors can diagnose brain disease, abdominal tumors or masses, and formulate radiation treatment plans. Nowadays, rapid pathological diagnosis techniques are widely used in surgery to show the scope of surgical resection (切除术). Because of the increasing use of microscopes, X-Ray, CT and MRI technology over the past 30 years, disease can be diagnosed earlier and more accurately in China, improving the quality of life for Chinese people. These five pictures illustrate the development of medical technology and science, through which lots of advances in technology have been made to improve the formerly poor conditions in Chinese hospitals. At the left, there’s a very useful machine that includes a respirator monitor and a heart monitor. Secondly, thanks to the microscope, the doctors can test the blood and bacteria accurately. The middle picture illustrates aseptic surgical techniques. Since aseptic practices were introduced into the hospital, they have saved a large number of people who couldn’t have been cured with drug treatment alone. Next, a doctor is testing blood pressure with a stethoscope. This examination method is very helpful when looking for heart and lung illnesses. Finally, a nurse in a pink gown has just delivered a baby for a pregnant woman. Today, a great number of people choose to give birth in big hospitals. Thanks to advanced medical technology, Chinese physicians have made great progress in controlling illnesses. The roles and obligations of nurses in China have transformed through three remarkable stages during the past three thousands years. From 1500 BC to the early 1900s, doctors performed the duties now performed by nurses. In fact, the nursing profession did not exist in China at that time. Doctors gave physical treatment such as acupuncture (针刺法) and moxibustion (艾灸术) and prescribed herbs. Medical care in this stage was called TCM (Traditional Chinese Medicine). The second stage started at the beginning of the 20th century, when nurses started taking part in medical treatment. However, they just followed doctors' orders, confining themselves to giving injections and transfusions, and paid little attention to patients’ psychological needs. In 2006, the China International Nursing Conference ushered in a new start in the field of nursing in China. The Conference determined that nurses ought to have full participation in medical treatment, including giving drugs, listening attentively to patients and helping doctors formulate treatment programs. These are shown in the picture. In the last three thousands years, nursing roles and obligations have changed in China, first performed by doctors, then (in modern times) expanding from just giving medications to collaborating with doctors to improve many aspects of physical and mental health. This illustration emphasizes the importance of nurses in modern medical care. Some people believe that doctors play more important roles than nurses, but in reality, nurses are just as significant in hospitals as doctors. First, the nurses' work is an essential supplement to what doctors do. For example, doctors write prescriptions, but nurses normally administer medicine to the patients. Secondly, not only do patients need medicine and surgery, but they also need careful nursing. Sometimes, patients can even get some advantages from nurses that doctors can't offer. For example, elderly patients with chronic diseases need more nursing than drugs. Therefore, because nurses help doctors, administer medicine, and provide practical care to patients, the great value of nursing shouldn't be ignored. In recent years, China has faced a critical situation in relation to occupational diseases (职业病), and solving it will require the cooperation of the legislators, government officials, enterprises and even workers themselves. For example: Pneumoconiosis (尘肺) is one of the most common occupational diseases; this is a chronic lung disease caused by the inhalation of various forms of dust particles and which leads to pulmonary fibrosis (肺纤维化). National statistics shows that China has had over 50,000 cumulative cases of Pneumoconiosis, with 8,000 to 9,000 new cases each year. In 2002, China’s government passed The Law on the Prevention and Treatment of Occupational Diseases. According to this law, laborers are entitled to certain rights of occupational health protection (like having access to relevant knowledge about occupational health), and employers must create a work environment and conditions that meet the law’s occupational health standards and health requirements. According to law, the government hygiene department must keep on supervising the number of these cases. To summarize, law makers, the government hygiene department, employers, and workers have started to work together to fight Pneumoconiosis and China’s other occupational diseases. This picture shows an expensive machine and a worker getting medical help. This emphasizes the benefits common people get from China's public health care system. In old China, neither common people nor the government had enough money for comprehensive medical treatment. With the development of society, the situation has changed: China's Health Ministry and the Ministry of Finance are working together to improve the national health infrastructure. The government has allocated 9.4 billion yuan to establish the rural cooperative health system, and it looks like the State Council's target of covering 80 percent of the country's rural areas by the end of 2007 will be met. In 2000, the country instituted a new cooperative system to ease the burden of health costs on farmers, where one-third of the cost would be borne each by the farmer, the local government, and the central government. Furthermore, China is seeking to tighten regulations to improve the quality of care and improve cooperation with other nations to fight diseases that cross national boundaries. In the past, the poor didn't have access to elementary medical treatment, but now, China's public health care system allows both the poor and the rich to enjoy the same medical treatment. The professionalism and personal qualities of nurses and patient-nurse cooperation play an extremely important role in restoring patients to complete health. First, nurses' professionalism has a great impact on patients' physiological recovery. During some medical procedures such as transfusions and surgical operations, even a tiny mistake could put the patients at risk, but skilled nurses make daily choices that bring healing. Second, nurses' personal qualities impact patients' psychological recovery. When interacting with patients, nurses should adopt a positive attitude, use polite words and use good behavior. These personal qualities can help change patients’ undesirable mindset and behavior, alleviate their anxiety and nervousness, give play to their initiative and establish their confidence to overcome the disease. In the end, the patients' restoration to health depends on their understanding and cooperation with nurses. Nurses’ professionalism, personal qualities, and harmonious relationship with patients work together to bring the patients’ total physiological and psychological recovery. The painting illustrates the core spirit of nursing: the patient is the center of the nurse's concern. There are five basic things a nurse should do. (1) Caring for the patient is the very heart of nursing. (2) Nurses work with the doctors to cure the patients. (3) The nurse protects the patient's privacy. (4) Nurses also teach the patient and family members to promote health and prevent illness. (5) Nurses speak for patients (advocacy), interceding when necessary. As a nurse, one should have love, patience, circumspection and responsibility in order to give the patient hope and a healthy life. Sometimes nurses should do more than just caring, such as telling a story to the children or sacrificing their personal time to be with the patient. Many changes have taken place since Florence Nightingale (l820-1910) founded modern nursing. Today, the nurse plays a very important role in the hospital. There is a saying that the doctor is the angel, but we can also say that the nurse is the angel's wings. Due to the wide scope of their work—caring, curing, protecting, teaching, advocating, sacrificing and more—each of us should respect nurses and their career.